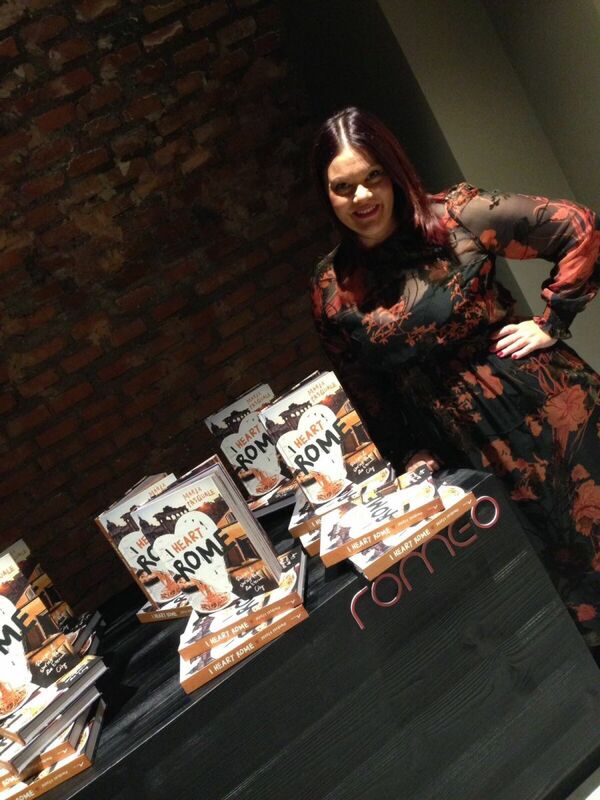 I recently unveiled I Heart Rome, the book at two special events in Rome to a combined audience of around 170 people. To think I only knew one person when I moved here! There are so many people around the world, especially my family and friends in Australia who couldn’t attend and so I have translated the speech I delivered to give you a taste of what went down at these emotion-charged events. Here is a video that was played on the night and below is the speech (translated from Italian into English, so excuse the imperfections). 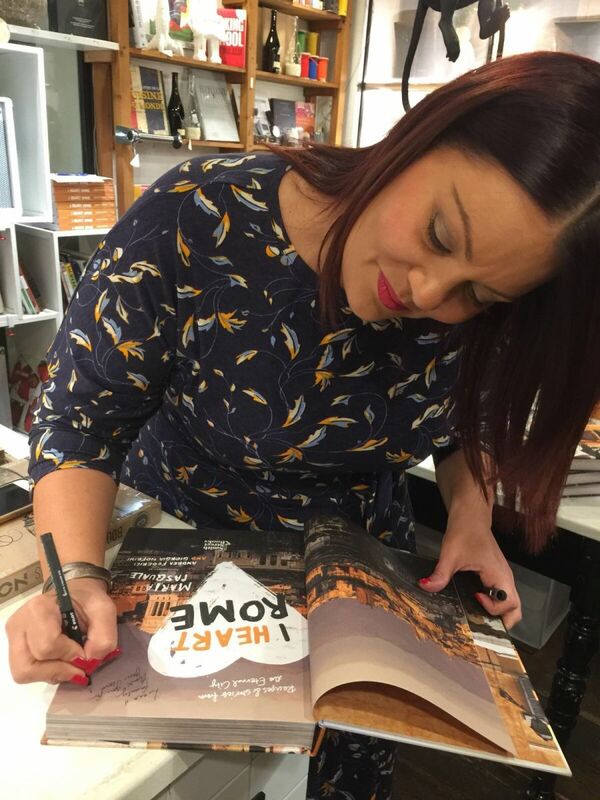 Big thanks go to Cristina Bowerman who delivered a moving message via video link, the staff at Romeo Chef & Baker, thank you to Marco and Marina of Emporio Libreria for my second event and moderators Alice Adams and Jules Murdocca. For info on how to buy the book, click here. “Good evening everyone. First of all, thanks for being here this evening. I’d have to say, this is probably one of the best and most important nights of my life and my career to date. It warms my heart to see so many of you here. As you can imagine, I’m feeling very emotional and nervous. Those of you who know me well, know that it’s been a big year. I’ll try to briefly explain the reason why, and to give you some insight into how I’m feeling. I’ve reflected on many things in the last few weeks. In writing this speech, I’ve been trying to work out how to express what I’m feeling. It’s true that it’s a wonderful thing to achieve an objective and realise a dream. But for me, this book represents so much more. It represents sacrifices made. It represents the challenges of living so far away from my family, who I’m very close to. It represents new and unforgettable experiences. It represents everything that I’ve learned since moving to Rome and all the wonderful relationships I’ve built over the last six years. It represents my rebirth in a new city, in a country that has a special place in my heart and with which my bond continues to grow each day (even though it is not my country of birth). It represents my adventures – leaving my country of birth with just a bag full of dreams, just like my parents did 50 years ago but we each did it for different reasons: them in search of a better life, me, because of a strong connection to my roots. To be the child of migrants is something that for many of you, can only be described. Because if you haven’t lived it, it is difficult to understand what it truly means. I’m sharing this with you because this strong connection is the thing that made me so intrigued with Italy, made me fall in love with Italy, and today makes me feel Italian. It is what brought me to live here in Rome and want to share Rome with the world. I’m proud to be born into an Italian family overseas because this has enriched my life and given me the advantage of having two cultures, two realities, and now two homes. I remember like it was yesterday when I broke the news to my parents about my decision to move to Italy. My mum simply cried. My dad however, had an expression which was a mix of perplexity and failure. As an immigrant who made many sacrifices to create a life in a new country and build a life for his family, it wouldn’t have been easy to hear that I wanted to go back to Italy. I think in that moment, he was wondering “what happened to this daughter of mine who until now has always done the right thing?”. Making reference to the economic problems in Italy, he asked “Tell me, what do you think you’re going to find in Italy?”. Now, I’m convinced that – maybe not in that exact moment, but in the years that followed – he saw a bit of himself in me. A bit of the grit, determination and spirit of adventure, in short, the critical things needed to move to the other side of the world and start from scratch. Shortly, thanks to the extract from my book I’ll have the pleasure of reading, both he and you will finally understand “what” it is that I found in Italy. I never could have imagined I’d find true friends and be surrounded by such love and support, let alone be able to write a book and share my love for the eternal city and my small, humble story with the world. Perhaps now you can understand my emotion. This book for me, is much more than a simple book. 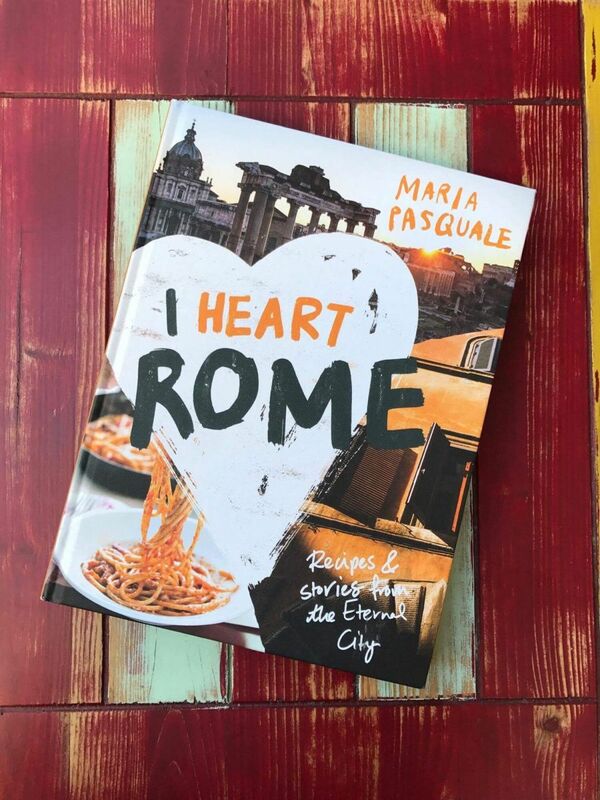 It is a love letter to Rome. And through its stories, gorgeous photos and various interviews, I can hand on heart say that I’ve shared with you all of my Rome. Rome is part of my heart and will always be a window into a chapter of my life that saw much sacrifice, hard work and satisfaction. A chapter in which I’ve managed to combine all of my life’s passions. A chapter I’ll never forget. 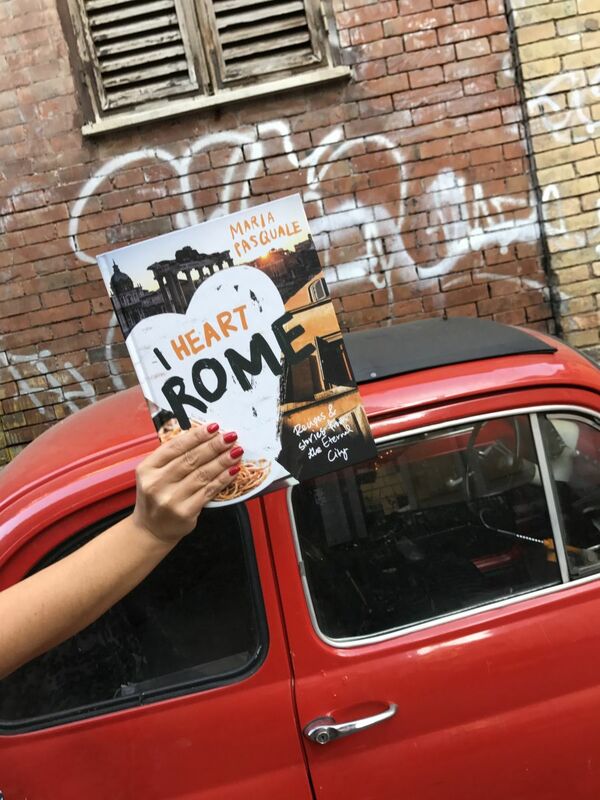 When I sent my final proposal to the publisher in Australia, my sole objective was to share my love for Rome, and above all, the regard I have for the people that form part of my daily life in Rome. So, this book isn’t just a love letter to this city, but a love letter for all the people that work every day to preserve old traditions and create new ones. People like Cristina Bowerman, who has been so generous with me. People like Roberto Pollica (known in Trastevere as Signor Roberto), who has worked for the last 50 years at my local cheese shop Antica Caciara. People like Stefania Innocenti at my beloved Biscottificio Innocenti, who runs the bakery that has been in the family for generations. 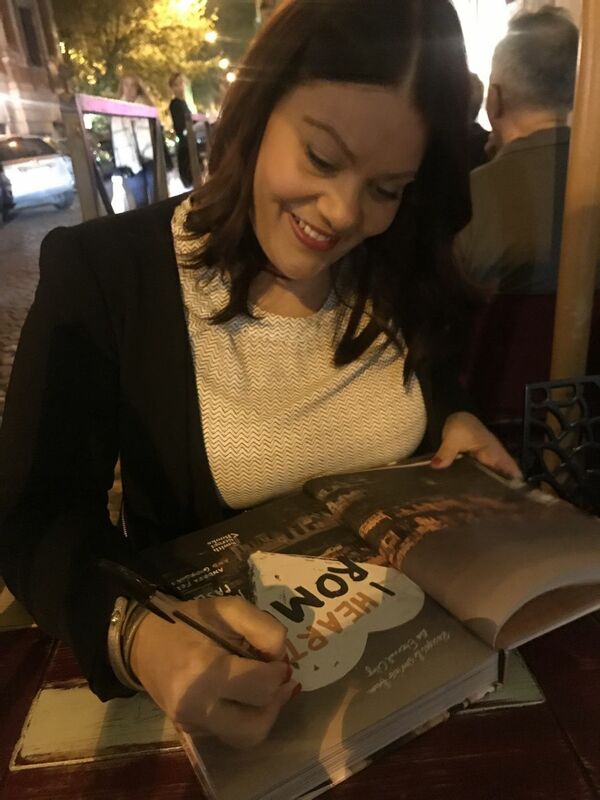 People like Maria Chiara di Felice at my trusted and beloved trattoria Da Enzo – her passion for her work and for Rome will always be in my heart. And Leo from Osteria der Belli, who, when I asked for his recipe for his famous spaghetti alle vongole, worried that it was too simple a dish to share! On the contrary – let us remember that this is a great country; its cuisine and traditions are renowned all over the world. While Italians have lived through some dark moments in the last few years – given the economic crisis – and have lost many things, something that will always live on is its famous culinary traditions. Before sharing an extract from my book, I have many thank yous to make – so I ask for a little bit more patience. Firstly, I’d like to thank the great chef and my friend, Cristina Bowerman, for her admiration and generosity. Thanks to all the staff here at Romeo Chef & Baker for putting on a great event. Thanks to my publisher, Smith Street Books in Melbourne, Simon and Chuster in Sydney, Abraham & Chronicle in the UK and Rizzoli in the USA. Thanks for believing in me and for taking a chance on my dream. 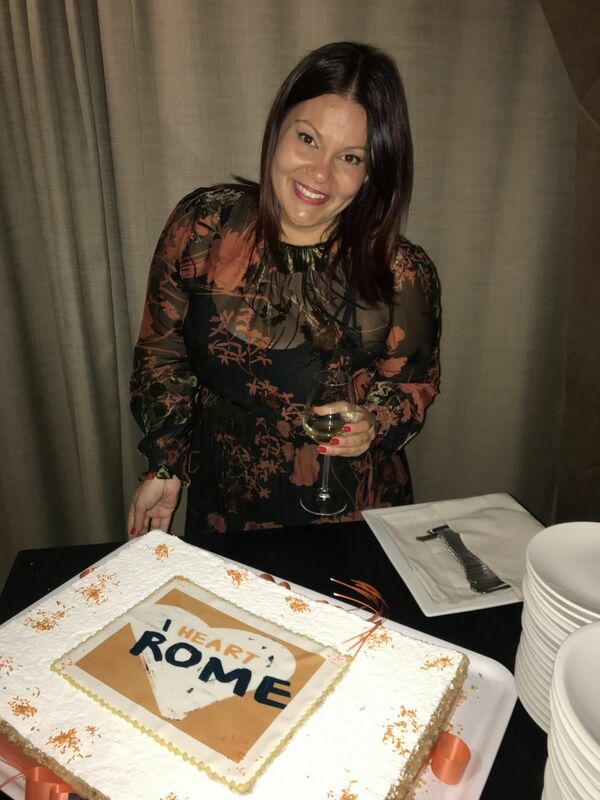 The most wonderful food stylist in the world – Australian like me, AS Roma fan like me, and even a Carlton supporter like me – Alice Adams. And many thanks also to her staff. Thanks to my fantastic photographers whose talent blew me away – Andrea Federici for all his photos of Rome and food shots on location, and Giorgia Nofrini for all of her food shots in the studio. Kate Zagorski, Angelo Preziosi and little Emilia. 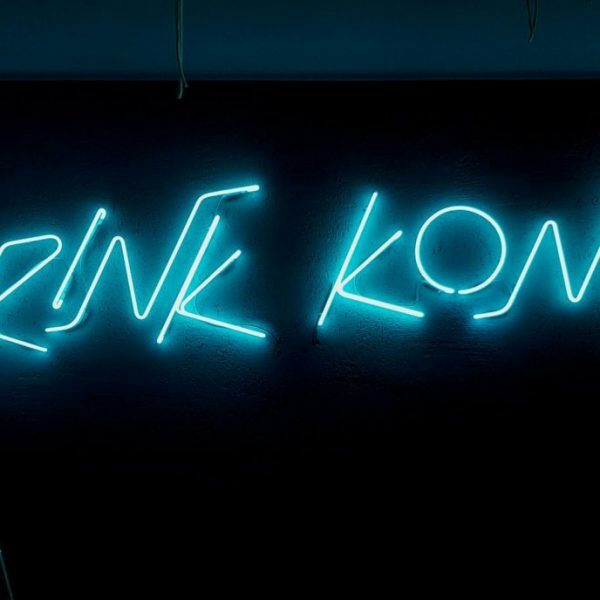 Like I wrote in my book – there’s not enough gin in the world to thank you for your support and contribution. Kate helped me day and night with developing and translating recipes. Angelo is an amazing cook, and you’ll find at least 12 of his family recipes in the book. He, along with my dear friend Toni Brancatisano, helped me in the studio with preparing the plates to be shot. Toni, thanks for your friendship, for sharing your recipes and for testing others. Thanks from the heart. Thanks to all the restaurants and venues of Rome who contributed recipes and gave up their time and advice: Da Enzo al 29, Osteria der Belli, Antica Caciara, I Suppli, Biscottificio Innocenti, Da Ivo, Antico Forno Roscioli, Salumeria Roscioli, Caffe Roscioli, Marzapane, Romeo Chef & Baker, Chinappi, Secondo Tradizione, Hotel de Russie, Rome Waldorf Astoria Cavalieri, The Jerry Thomas Project, Fatamorgana Gelateria, Trapizzino and Enoteca La Torre. Thanks to the people I interviewed in my book for giving up their time and sharing stories straight from the heart: Roberto Pollica, Loreto Bizzarri, Cristina Bowerman, Stefano Callegari, Marco Lori, Maria Chiara di Felice, Laura Ravaioli, Stefania Innocenti, Vittorio Olivieri and Eleonora Baldwin. For other recipes, many thanks to Gina Tringali, Carla Tomasi and my dear Roman friends Fernanda Menozzi, Viviana Gori, Maurizio Misso and Eleonora Chiari. 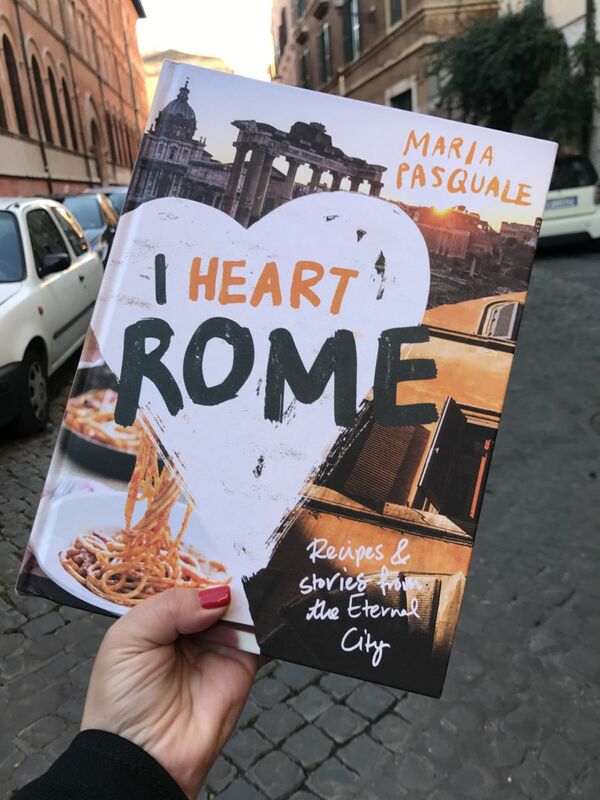 Thanks to many other collaborators: Beatrice Mencatini, Beatrice Tarizzo from Aromi Creativi, Sabrina and Paolo Tocchio, and the 15+ people who tested and tasted all my recipes, both in Australia and here in Rome. The blogging community and press – both here in Italy and overseas – thank you because you’ve also become friends. Speaking of friends; even if they’re not here tonight, I’d like to thank all my friends in Australia and overseas, who, despite the distance, still manage to be close to me. Thanks to all my dear friends in Rome who are here tonight. I love you all – there are many of you here and I won’t name you all – but know that not only are you part of my story here in Rome, but you’ve also become part of my family. A shout out to Marianna Martone, for your sense of humour and for being my unofficial assistant during all the photo shoots. And Fulvia Martone – words cannot express my gratitude for what you do for me, for being my sister here in Rome, and for having always believed in my little (big) dream, for the advice, translations, and above all, true friendship. I wish the world for you and love you very much. Thanks to all my friends who have made the trip to Rome especially for tonight’s event – Valeria, Holly, Naomi, and my wonderful friend Fiona, who couldn’t make it, yet here she is! A wonderful surprise. Thanks to all my family in Australia, who couldn’t be here tonight, but I’ll be seeing soon to spend the summer and Christmas together in Melbourne, where I’ll also be hosting four other book events. Thanks to my parents who arrived less than a week ago from Melbourne. When I heard they’d be coming, it really hit me that tonight and this moment is so important for them too. I thank them for having taught me the value of having two cultures, and for having always supported me in achieving my dreams. I miss you every day and I love you very much. And lastly, I’d like to thank my sister Lara, who arrived two days ago, and is only staying for a week. She read, edited and discussed every single piece of this book with me and helped me in ways I can’t explain. You mean everything and more to me.